KUALA LUMPUR: Property developer SP Setia Bhd’s sales hit RM1.04bil at June 30, well before its financial year ending Oct 31. President and chief executive officer Tan Sri Liew Kee Sin attributed the success to the company’s 5/95 programme which gave various incentives to house buyers. The programe started Jan 19 and ends July 19. “Due to the overwhelming success of the programme, we have extended it for another three months,” Liew told a press conference yesterday. The home loan package allows a buyer to pay only an initial 5% of the house price. All legal fees and stamp duties on the sales and purchase agreement are borne by the company. Liew said SP Setia would not extend the package when it ended on July 19. “We will stop launching new products for a couple of months to focus on building more quality homes,” he said. He noted that the 5/95 programme was initiated by SP Setia but had now been adopted by other developers to market their houses. Going forward, Liew said, SP Setia would continue to brand, build and execute marketing strategies that were cost efficient and proven effective. Currently, its total undeveloped land bank stood at 1,600ha. On its performance, Liew said SP Setia had managed to ramp up sales despite the tough market conditions. “Our sales figures are good but our net profit this year should be lower than last year, impacted by (high) raw material costs,” he said. On the company’s overseas foray, Liew said sales from Vietnam should hit RM50mil. However, he said, SP Setia was still at the getting-to-know stage in China. “It’s still early days for us in China,” he said, adding that contribution from overseas operations remained insignificant. SP SETIA Bhd, the country's biggest property developer, said it will take a year before it embarks on its maiden project in China. The company is serious about its 10ha mixed property project in the growth corridor of XiaoShan, Hangzhou in Zhejiang province and is doing a feasibility study, its chief executive officer Tan Sri Liew Kee Sin said. Last month, SP Setia inked a deal to partner Hangzhou Ju Shen Construction Engineering Ltd. The China venture follows SP Setia's first overseas foray into Vietnam in mid-2007, where it is developing EcoLakes with partner Becamex IDC Corp, in Binh Duong Province, 40km north of Ho Chi Minh City. EcoLakes comprises link houses, villas, apartments and semi-detached homes, among others and is worth RM2.1 billion. Liew said RM50 million in sales have been achieved from EcoLakes and it will be recognised in fiscal 2010. 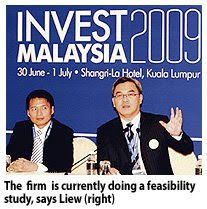 "We are expanding overseas but the focus will still be in Malaysia as there is a lot more to develop here," Liew told reporters at Invest Malaysia conference yesterday. SP Setia's total undeveloped land stands at 1,600ha, inclusive of 240ha in Vietnam, which could potentially generate more than RM30 billion in sales under better market conditions, Liew said. Liew said SP Setia's net profit for the current financial year ending October 31 2009 will be slightly affected due to higher costs of construction. Nevertheless, he was expecting the company to do better in 2010 as raw materials price are expected to drop. SP Setia is also on track to meet its targeted RM1.1 billion revenue this year thanks to its "Setia 5/95 Home Loan Package". It has so far made RM1.04 billion in revenue. In 2008, SP Setia made a net profit of RM213 million on revenue of RM1.33 billion. UEM Land Bhd is in talks with four to five parties to replace Middle East developer Damac Properties and invest in its Puteri Harbour project in Nusajaya, Johor. Last month, Damac Properties backed out of a deal to buy 17.4 hectares for RM396 million. "When it was brought to the board's attention we believe that we had fulfilled (all the conditions of the sale and purchase agreement), but Damac contested," UEM Land Bhd managing director Wan Abdullah Wan Ibrahim told reporters on the sidelines of Invest Malaysia in Kuala Lumpur yesterday. Arbitration was an option but the board decided against prolonging the issue. Wan Abdullah said the entry of an investor is not urgent now but it would be needed at some point in order to make the project a success. "We can certainly continue our work now, but we need partners to create that busyness, to create that critical mass, we can't do it alone, we don't have enough money in the kitty to do it," Wan Abdullah said. UEM Land is asking for a RM354 million syndicated term loan from two local banks to finance its developments. "The bank's management have forwarded it to the credit committee and we will know in a few weeks," Wan Abdullah said. UEM Land's gearing is currently at 0.35 times. Wan Abdullah is hopeful that UEM Land will secure an investor by the end of the year. But it will be more cautious and iron out funding details before going ahead with the signing. The interested parties included investors from Australia, Singapore and locals. UEM Land is asking for RM250 per sq ft for the land now, higher than the average RM205 per sq ft it closed with Damac Properties in 2008. "We will not bring it (the price) down, the only way the price is going, is up. When we transacted with Damac, you couldn't see the land form yet but if you go to the land site today, the private marina is almost completed, and full completion slotted for the end of the year," Wan Abdullah said. Meanwhile, he said UEM Land is working on a high-end development in Cyberjaya, with a gross development value of RM1 billion. The project is to be completed by the fourth quarter of the year. KUALA LUMPUR: UEM Land Bhd is confident of completing the construction of its three buildings in Nusajaya, Iskandar Malaysia, by year-end despite the withdrawal of its major partner, Damac Properties (M) Sdn Bhd. Managing director Wan Abdullah Wan Ibrahim said the company would also increase the price of its 43-acre waterfront development in Nusajaya to RM250 per sq ft from RM205 previously. “Before the end of this year, three buildings will be ready in Nusajaya. However, we can’t reveal who will be the owners of the buildings until the agreements are signed,” he said. UEM Land will be completing the construction of its family entertainment centre, a four-star hotel and an apartment block fronting the marina despite the withdrawal of its Dubai-based partner. However, Wan Abdullah said the company still needed new investments to create the critical mass and businesses for the new development. “We need investors to create the critical mass and excitement. Nonetheless, we believe investors will have more confidence to invest in Nusajaya once these three buildings are up,” he said. The company is in talks with potential local and overseas developers, including from Australia and Singapore, to take over Damac’s place. “We are also actively making new contacts with other parties,” said Wan Abdullah. Last month, UEM Land announced that its agreement with Damac for the RM396mil sale of 43.5 acres in Puteri Harbour, Nusajaya, had lapsed. On the potential transaction value of the property, he said: “We will not bring the price down, for sure. The only way for the price to go is up. Meanwhile, UEM Land is working out a RM354mil syndicated term loan with two banks for its working capital. “The banks’ managements have forwarded it to the credit committee and we should know (the results) in a few weeks,” he said. Currently, UEM Land has a land bank of 11,000 acres. PETALING JAYA: Household loans, notably for residential properties, are expected to drive loans growth for many banks this year, industry players say. Although it had slowed, growth prospects for residential loans continued to look favourable on an expected recovery in the country’ economy by the year-end and a steady demand for homes, they said. Hong Leong Bank was projecting a growth of 5% to 8% for loans to the residential sector over the next 12 months, said chief operating officer for personal financial services Moey Tan. “While the growth will remain positive, the projected rate of 5% to 8% has softened compared with April 2009 growth rate of 10% for residential loans. “We remain optimistic that there will be positive growth as the general consensus among the public is that residential properties will remain a good investment during these uncertain inflationary times. “Also, demand for owner-occupied landed properties will remain resilient due to the steady population growth,’’ she told StarBizWeek in an e-mail reply. Furthermore, she noted that prices of landed residential properties had continued to remain stable even in the current economic environment. “Residential loans currently contribute 41% of the bank’s total loan base and would continue to be a key driver of growth and profit for Hong Leong Bank,’’ Tan said. Residential property loans made up 27% of the total loans in the industry, she said, adding that Hong Leong Bank expected household loans to be a significant driver of growth in the next 24 months. Alliance Bank Malaysia Bhd had seen a growth of 3.3% in household sector loans for the quarter ended March 31 compared with the previous quarter, driven mainly by mortgage and unsecured loans, according to group CEO Datuk Bridget Lai. Alliance Bank has also seen increasing interest from customers in refinancing their properties to reduce borrowing costs due to lower interest rates. 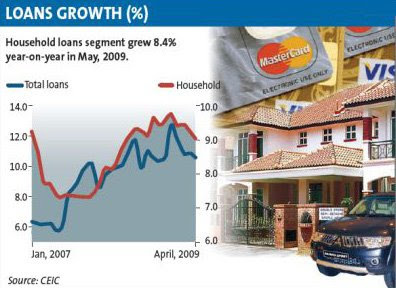 “The bank expects loans growth for the household sector to increase marginally this year compared with last year, as we begin to see stability trickling back into the economy following expectations that the country is heading towards a recovery come the end of 2009,’’ Lai said. According to Lai, household sector loans (mortgage, hire-purchase, credit card and personal loans) as at March made up 60% of Alliance’s total loans portfolio. Based on Bank Negara’s latest statistics, loans disbursed to household in May grew annually by 10% to RM17.3bil compared with RM16.9bil in April. OSK Research attributed the growth of household loans mainly to the purchase of residential properties, apart from hire-purchase and credit-card loans. On an annual basis, outstanding household loans expanded by 8.4% at end-May against 8.5% the preceding month. Malaysian Rating Corp Bhd chief economist Nor Zahidi Alias sees slower growth in household loans this year due to the weak economy and given that the country’s external sector has yet to fully show a firm turnaround. “Against such a backdrop, there are fewer qualified borrowers because labour market conditions and income prospects are still deteriorating. “This will make financial institutions more cautious in their lending practices as some banks are already seeing higher non-performing loans ratio,’’ Zahidi said. RHB Bank sees 5% to 7% growth in its consumer home loan portfolio, which is at parity with last year’s level and above the industry growth targets, according to head of retail banking Renzo Viegas. RHB was aggressively targeting the refinancing sector as well as customising end-financing packages with developers, he said. Viegas also said the bank had adopted risk-based pricing whereby it offered better rates for loans with lower loan-to-value (LTV) ratios and customers who opted for mortgage reducing term assurance (MRTA) for their loans. The LTV is the size of a loan against the value of the property while MRTA guarantees the repayment of a mortgage loan in the event of the borrower’s death or total and permanent disability. OCBC Bank (M) Bhd head of secured lending Thoo Mee Ling said home loans would be one of the main growth drivers for the bank. Thoo said OCBC had been outperforming the industry in terms of total home loans approved as it had experienced growth of more than 100% from January to April. SINGAPORE: Singapore real estate prices fell in the April-June period for a fourth straight quarter amid the city-state's worst ever recession. Private residential property prices fell 5.9 per cent in the second quarter from the previous quarter after plunging 14 per cent in the first quarter, the Urban Redevelopment Authority said yesterday. Prices, which have fallen about 26 per cent since early last year, could plummet further as tens of thousands of new apartments become available over the coming months, said Yuwa Hedrick-Wong, Asia-Pacific economic adviser for MasterCard in Singapore. "I'm afraid prices will crash again," Hedrick-Wong said. Singapore's gross domestic product fell a seasonally adjusted, annualised 14.6 per cent in the first quarter. The government expects the economy to shrink as much as 9 per cent this year. Private property prices soared almost 50 per cent during 2006 and 2007 as a growing economy and the easy availability of credit fueled speculation, with new apartments sometimes changing hands many times before completion. Prices of government-built housing, where more than 70 per cent of Singaporeans live, rose 1.2 per cent in the second quarter, making up for a 0.8 per cent drop in the first quarter, the authority said. Three of Sunway City Bhd’s projects recently won the coveted Green Mark certifications from Singapore’s Building and Construction Authority. Its high rise residential development called Sunway Pallazio in Sri Hartamas won the Green Mark Gold Award and the Best High Rise Development in Malaysia Award, while Sunway Challis Damansara received the Green Mark Certified Award. JOHOR is studying plans to connect Iskandar Malaysia to Singapore via mass rapid transit (MRT) system over the next five years, now that chances for a third bridge across the causeway get slimmer. "Maybe it will be interfacing with the Singapore MRT and Iskandar Malaysia's own MRT system, we are working on it now," Menteri Besar Datuk Abdul Ghani Othman told reporters on the sideline of Invest Malaysia conference in Kuala Lumpur yesterday. "We are looking at multi-models to boost connectivity with Singapore. We need that in Johor Baru," he said. He said Singapore has suggested to extend its new Thompson Line, which is now under construction, to Johor Baru. But that line won't be ready until 2018, Ghani said. Traffic is heavy between the southern state with neighbouring Singapore. Everyday, no less than 60,000 Singporeans enter Malaysia through Johor, Ghani said. The proposal to build a third link to the island republic has now become a "medium to long term" target, Ghani said, after the Johor Sultan publicly opposed to the idea recently. The state now plans to boost connectivity between the two region with multiple transport modes. A quick step it can take immediately is to develop a efficient bus system both within Johor and between JB and Singapore, he said. "We may also look at a commuter train between Johor and Singapore. We will optimise several transport options on the causeway itself," he added. Meanwhile, the menteri besar said that Johor expects to attract RM9 billion worth of investment this year. The state has pulled in RM2.3 billion in the first quarter.